so cute! I love all the colors but I think the green!! Great giveaway!!! Ohh I love those! I especially love the blue. Thanks for the chance! These are great! I love the red. Thanks for the opportunity! I would LOVE to add one of these to my stash! I can only just now start to say I have a stash so I'm in definite need of cool additions. Thanks for the fun giveaway! I think I need that in my stash. Imagine that as binding if you will! (or a million other things) I have no preference. All three are calling my name. IF I don't win I might have ot add that to my wishlist. I would love some in my stash!! What a cute name to match cute fabric! I love the green! Thanks for the great giveaway! :) I'm still building my stash, so this would be fabulous. I love these & really have no preference. Each time I decide one is my favorite, I look at the others & say no! Getting into the pez craze so late, any of these in my stash would be fantastic! Thanks for the opportunity! I love these prints too! I really love the blue print, but all of them are great! thanks for hosting such a great giveaway. They are great prints! I love American Jane's fabrics. What a generous giveaway. I love the red best, but they are all very nice colours. So pretty! I love American Jane fabrics and patterns. My favorite of the three is the blue, but they all are wonderful! Very cool! The blue is calling to me. Thanks for the chance! You are so sweet to share these with us! I think I could use the red in more things, but I do love all the colors. Thanks for the chance to win! Awesome! I love all of them, but the green is my favorite. Such neat prints!! All the colors are great, but if I had to pick just one, it would probably be the red one!! Great stash additions! It is extremely difficult, but my first choice would be the blue background. Thanks so much for sharing with us! so lovely!! i'd love the blue one, but really, all of them are great! I am so kicking myself for not going to the quilt show!! I absolutely have to go next year and save up so I can find some gems! These are awesome!! I would love any of these colors, they are all great! Hard to pick a favorite - all three colors are great - but I do love that green. Such a nice giveaway - thanks! 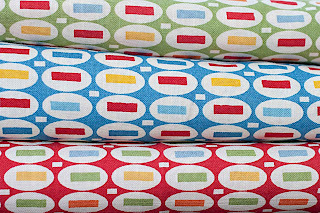 oh my goodness....I just love these fabrics and no I don't have a preference...they are just awesome. Thanks for such a wonderful giveaway. YES!! I agree!! Needed in Stash!! Green!! PLEASE!! Oh, yummy. I like the blue best! ohhh fun and would be a great addition to a stash. I would be happy with any of them but, green grabs my eye. Thanks for a chance! oh great fabric, I like all of them but blue one is great. I love all of the colors! Green is my favorite color though! Thanks! I would love to win this for my stash but it won't stay in my stash as I have the perfect pattern to use it in. Thanks for the giveaway. I couldn't pick one -- any would be wonderful to have! I think the red is gorgeous! I can't choose! If I am a lucky winner, I'd be happy to have any of 'em! Thanks for such a great giveaway! Great find while you were in town!! I love the blue in particular! Thanks for a chance at the giveaway! I love those prints too. The blue is my favorite! Thanks for the giveaway! I like all of them. Thanks for the giveaway. OOOHhh..i really hope i win!! The blue is my favorite! Oh definitely the red would be good in my stash. I've only had one charm square of the green one and that was used up pretty quickly. Thanks for the chance to win some. I love the multi pez!!! You can't help but smile when you look at these fun prints, I think the blue would have to be my fav though. Thanks for sharing your great find!!! The blue is my favorite, but they are all lovely! Oh I love them all. If I won you could surprise me with any of them. Ha! Peas and Carrots... clever name!! These look so adorable together, and can't wait to see what you do with them. If I were to win, I would hope that green one would fit it's way to me -- guess that means I like more peas than carrots? Thanks for hosting this giveaway! I would love to add some to my stash - red or blue is my choice, but I would take any! I'm not sure I could choose between the blue & green, they're both great! Awesome fabric! I love them all. I guess if I have to pick, I would pick red. Thanks for the opportunity. So cute.....I think the red is my favorite. What a generous giveaway!....I love this fabric too. I am all out of mine so more would be fantastic! The blue would be perfect for a project I am working on...thanks a bunch for the chance! I love them all! Thanks so much! I have just as much trouble making a decision when there's only three choices as I do in a big, old quilt shop! I love any American Jane fabrics. I'm just now making a yoyo quilt with American Jane Recess fabrics. Love the colours and tones. that is so nice of you to share some of your cute fabric. I would choose the blue if I won but I really like them all. They look like they would blend so well with those colors. Thanks for the chance to win. I LOVE them all ~ THANKS for the chance! I love them all, but the blue is my favorite. Thank you for the giveaway! Love the blue! I don't have any in my stash, but I should! These are so cute! I love the green one - but they're all beautiful! I love these, especially the green. What a great find! Thanks for the chance to win. Going through my scraps I notice that I needed more blue--yeah sure I do---like a HOLE in the HEAD! Anyway I will---take the BLUE!! Wow, what a generous give-away. I have 2 FQ's of the orange and light blue give-away so I'd be thrilled to win any of these. But the red is probably my favourite! The red....no, the green. But the blue is nice too. Definitely the green. No wait a minute the red. Or is it the green. Ps I don't mind, really, you're kind to offer! WOW! IT'S VERY DIFFICULT TO CHOOSE ONE-OK-RED! I'd love the blue one if I'm picked. I always regretted not buying a ton of this print. My fav is red. Oh my goodness they're all gorgeous and I'd love any of them! But I think blue is my favourite :). Thanks for sharing the fabric love. Green is my favorite, but I'd be happy with any of them. Lovin the red...just thinkin today I need to branch out of my brown.orange obsession! Blue is my favorite color, but this would really make a quilt POP. Thank you for the giveaway. Blue is beautiful! Thanks for the chance to win! 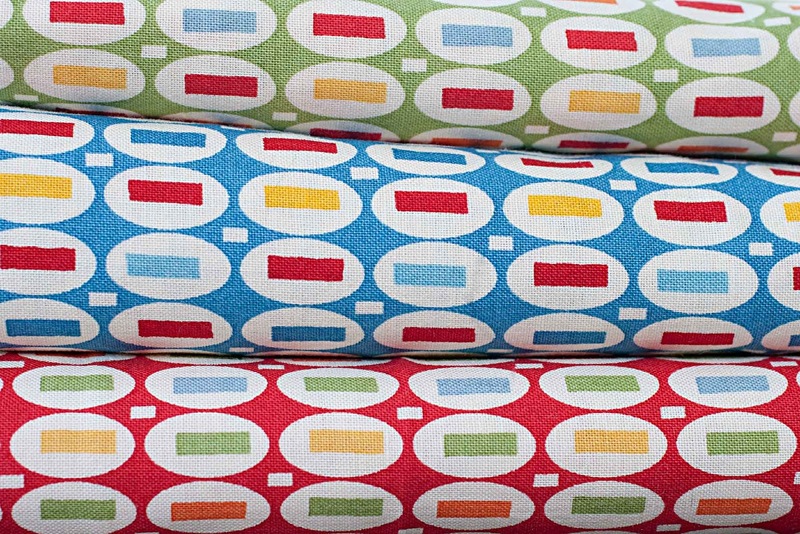 This IS great stash fabric! I think I like the red, but they're all adorable! I love them all so no colour preference!! These are so vibrant! If I really have to choose I'd go with the red. Or maybe blue? Such a sweet fabric line, I've seen it in blog pics, but not in person. Think red might be my fave, thanks for sharing! I totally agree that everyone needs some Pez in their stash! I have a teeny bit of the red that I have slowly been adding into scrappy projects here and there--I think I have about a 10" square left! I'd love to replenish, and thanks for the generous giveaway! I love all those fabrics but red always stands out for me. Thanks for the chance. ooohhh, they are all great, I guess my fav would be the red. Thanks so much for this generous giveaway. I'd love any color. I wouldn't be able to choose one colour - they're all amazing. I love that print!! If I win any color would me fine with me ...thanks for the chance to win! How nice of you!!! I love them all but if I had to choose I would pick blue please :) Thanks for a chance!!! Cute. I like the green. Thanks! Yes, everyone needs some! I'd love some red! I agree everyone needs some of this fabric. They are all so cute! Thanks in advance for the opportunity to win some. Green would be nice, but I would be glad to win any of it. I would normally say green, because green is my favorite color. But this time I'm going to say blue! Thanks for the super cute giveaway. This print is fabulous! All 3 are really bright & fun, but I think the blue is my favorite. Thanks for the chance to enter! Beautiful! I would love to win. I chose green because I love that shade! But I love all 3! Wow! I love the green, but all three are pretty prints. Oh, I love them all! Thanks for the chance to win one of those lovelies! It's a tough choice for "fave"--leaning towards the blue, but would be thrilled with any! Love love love them all!!!! So generous of you! I love the primary color look in these fabrics. They are great blenders! As long as the color is bright, I'm happy! Thanks for the giveaway! I love American Jane fabrics and patterns! Thank you for the giveaway! Great fabric, would love any of the colors. Thanks for the chance. I recently acquired an FE of the red, but I haven't put it into play yet. It's pretty great fabric, though! I'd love some of the blue. Thanks for sharing your loot with us! Thank you for this chance. I love them all but especially the blue. Wow the blue is fantastic. Thanks for bringing these lovelies back into view.